This is an ongoing series in which I share the tools and techniques we have found helpful in bringing comedy improvisation into our live-play RPG, The End of Time and Other Bothers. If you wish to start at the beginning, I would suggest Part 1 below. This series is designed for Game Masters and players of all levels. It is for anyone who wants to explore more advanced methods of shared storytelling. Using improvisation techniques allows us to leverage what has been learned by some of the best in-the-moment shared storytellers on the planet. And then to bring these techniques back to our tables. So many improvisations and shared stories are made or broken by the strength of the characters involved. You can listen and have the best offers, but if we don’t believe or relate to the characters in question, it’s all for nothing. A strong character is also an offer in and of itself. It gives something for your other players to work with. It creates a point of resonance for anyone participating in the story you are creating. And finally, it gives YOU a way to react to what is happening as the character you are playing. The more defined the character, the most immersive and fun the shared scene will be. Let’s use one of the characters from our table, the infamous Blat, and how he might respond to my attempt as the GM to get him to fly in public. For those unfamiliar, Blat prefers to never take his shirt off, and this is required for him to fly. Here is how this scene might play out if I’m not thinking about strong characters. GM: You can’t reach the key. It’s too high. Pretty straight forward, but also weak. My random villager is giving very little for Blat to work with. Which means Blat has to carry the scene alone and there is no escalation of offers happening. As a GM, it’s unlikely that I will have a character created for every instance that emerges in game play. So I have to come up with something in milliseconds. This can be tough, but it only takes a single idea for me to make a more interesting character. I just have to lean hard into this idea. In this case, the idea of a “flirt” comes to mind. Let’s see how that might play out and how that might allow Blat to build off of my stronger character. Blat directed at the GM: Fine. I’m taking my shirt off. GM: Squeeals and claps her hands, “Yas! Right here in the street? So naughty!” and she starts taking her clothes off too. All of this results from me giving something substantial to Blat. And it’s more fun for me to play as well. My character has a point-of-view and is way more invested in the scene. You can lean into just about any idea to create a stronger character, but below are some thought starters that can help to vary the personalities you create. Status: is this individual high nobility or a beggar on the street? Sexuality: is this person oozing sexuality or very prim and proper? Energy: are they bubbling with excitement or do they suffer from a sloth-like cynicism? Polarity: Are they always positive and happy or 100% certain that everything is going to end in the worst way possible? Innocence: Are they new to the world and fascinated by all they see? Or are they old, wise and weary? Your character doesn’t have to be at the extreme ends of any of the above traits. Rather, you just need to play them as intensely as you can. For example, I love playing a character that just can’t make up their mind — about anything. Maybe they make a decision and then change their mind only to fret and switch it back, ad infinitum. Great characters have a way of seeing the world. They have needs and wants and idiosyncrasies. And these needs and wants (and their upbringing) contribute to distortions in how they see the world around them. When I have time to create characters in advance, I do it all on a 4x6 notecard. This forces me to keep my character descriptions simple and to make BIG choices. I don’t have space to write up their backstory. I only get a few sentences, so I have to make them count. Three things go on every card: Wants, Must Have, and Quirk. Wants: Is your character motivated to achieve something? Or are they running away from something (internal or external)? Must Have: What is non-negotiable for them? What is a deep desire that they may not even know about themselves? Quirk: What makes them fun to play? Here is what is written on Snegal’s index card, our most beloved NPC character, to date. Description: Just over three feet tall (on his tiptoes) with red skin that glistens as if he is always sweating. His wings beat fruitlessly at the air as he scrambles around. A prehensile tail ends in a barb and his black orbs blink up at you almost innocently. The Wants and Must Have give me the lens for Snegal. He often fails to see what’s really going on when Blat is involved, as he is so lost in his infatuation. And when Blat calls him a “friend”, this is a momentous occasion for Snegal — a sign of respect of the highest magnitude. And sure, it’s not possible to create an index card in advance for every NPC that will appear in your campaign or world. In situations where I have to come up with a character in-the-moment, I might just select a trait or two like those listed earlier, but quite often I turn to a Totem. I love picking an animal to define the traits, outlook and motivations for an NPC. I find this is fast and easy to do on the fly and it creates for some truly memorable and fun characters to play. Ned as a dog for inspiration. Ned as a goat for inspiration. Ned as a snake for inspiration. With even a little practice, you will find it’s not all that hard to come in with strong offers and strong characters. Maybe they don’t always go as you expect, but it’s actually a lot of fun to create strong personalities and play them out at the table. The challenge is to maintain your character throughout the scene or interactions. Some of the most amazing scenes I’ve ever been involved in have fizzled out into nothingness because someone chose to back away from the character they created. If you create a sniveling beggar with delusions of grandeur, then by the gods on Mount Hezarot, don’t let go of this for a second. Play this for all it’s worth. Double down on the sniveling. Find that moment where this character realizes they can cheat the party and have everything they’ve always yearned for. And when they are caught, revert to the sniveling and grovelling. Only double down and make the party truly feel guilty for catching the little double-crosser. 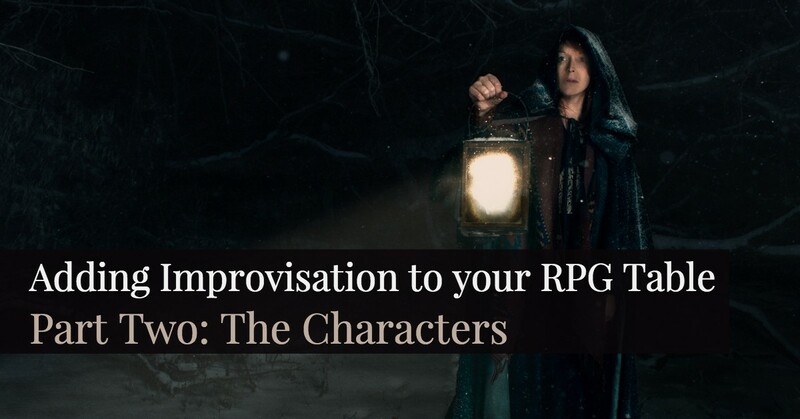 There is more to come in this series on using using improvisation at the RPG table, and I was truly inspired by all the comments I got about part 1. Please do continue to share your thoughts and experiences with me as you try these tools out.